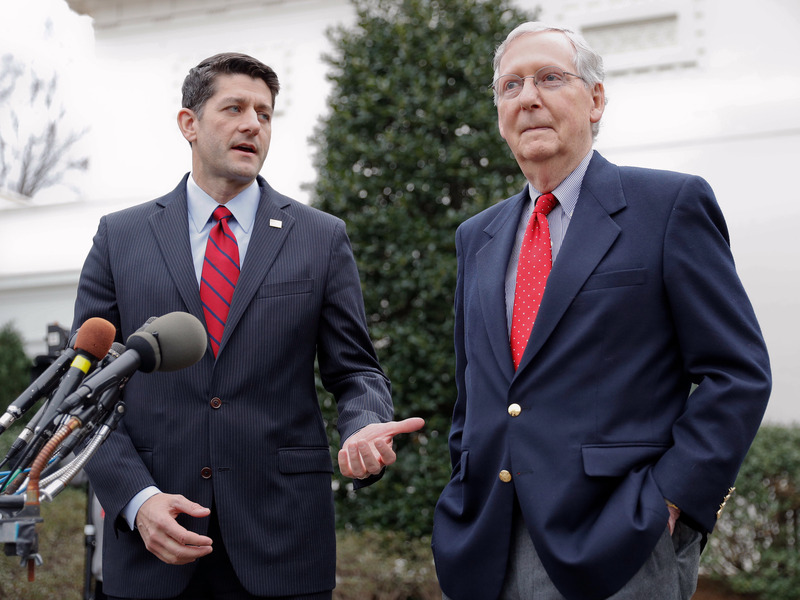 Pablo Martinez Monsivais/Getty ImagesHouse Speaker Paul Ryan and Senate Majority Leader Mitch McConnell. Dynamic scoring is a budget trick that makes tax cuts look more sensible than they are by estimating how much economic growth the cuts will create, then adding that estimation to budget projections. But not even that trick can save the GOP’s tax bill, according to the nonpartisan Tax Policy Center. Even when dynamic scoring is applied to the bill, it is still projected to add to the federal budget deficit. In Washington, there’s a magical way to make a budget look balanced even when it’s not – it’s called dynamic scoring. Basically, it allows bean counters to use growth projections to offset income lost from tax cuts. Dynamic scoring involves using economic models that supposedly show the effects of fiscal policy like a tax cut on growth. The idea is that by putting more money in investors’ and consumers’ pockets, a tax cut can add more juice to the economy, helping to make up for deficits caused by lost tax revenue. And since the 1980s – when a bunch of the Republican legislators trying to ram their tax bill down America’s throat were much younger – it has been a Band-Aid on budget-busting bills, using generous projections to show increased economic growth generated by tax cuts that would help the cuts pay for themselves. That’s called getting something for nothing, and if that’s not magic I don’t know what is. But this time around, the nonpartisan Tax Policy Center estimates that not even the magic of dynamic scoring can make this tax bill, called the Tax Cuts and Jobs Act, look good. It simply would not generate enough economic growth to make up for lost revenue from the cuts. “We find the legislation would boost US gross domestic product (GDP) 0.7 per cent in 2018, have little effect on GDP in 2027, and boost GDP 0.1 per cent in 2037,” the TPC report said. Using regular maths, the Senate tax bill is estimated to increase deficits by about $US1.4 trillion through 2027, the TPC said. Around 2028, some of the tax breaks for individuals would start to expire, and then the bill would “reduce deficits by about $US174 billion before taking into account macroeconomic effects and extra interest,” the TPC said. Throw dynamic scoring into the mix, and the bill’s cost decreases by only an additional $US34 billion. That would result in “a small net decline in deficits of about $US208 billion over the second 10 years,” the TPC said. In other words, not even magic can make this bill revenue-neutral. Even generous models show it would add to the deficit – and to the debt burden that future (and some current) American taxpayers would have to take on. The TPC reasons that the tax cut would boost demand from households a bit in the short run – but since the labour market is almost at full employment, that wouldn’t be anything to write home about. It could also boost the labour supply, too – but only temporarily, since those benefits would “be reversed after nearly all individual income tax provisions expire in 2025,” the TPC said, causing most people’s taxes to go up. Corporations would get to keep their tax break, but once deficits go up, the TPC says, high interest rates could temper their investments. “All these models tell roughly the same story: The Tax Cuts and Jobs Act won’t produce dramatic increases in the economy nor would it come close to paying for itself,” the TPC concluded. This goes against what Treasury Secretary Steve Mnuchin told Congress in January. “We do believe in dynamic scoring, and, with the appropriate growth, I think we want to make sure that tax reform doesn’t increase the deficit,” he said. Of course, maybe he didn’t realise what the tax bill would do, since his office never produced an analysis of its economic effects. We imagine the task would have taken too much time away from critical Bond-villain-role-playing/arm-length-leather-glove-shopping time with his wife. Around this time last year, I wrote that President Donald Trump would try to use this budget trick to steal from an entire generation. I was right, but I didn’t realise how ugly this would be, nor how little anyone in the GOP would care about even appearing to avoid adding to the national debt. It’s one thing to put lipstick on a pig. It’s another to realise the lipstick keeps melting off its snout and say: Oh, whatever. Wilbur still looks ready for the county fair. Pack him up. No one will notice. Dynamic scoring doesn’t go far enough to plug the holes in this tax bill, but since no one in the GOP actually cares about the appearance of fiscal responsibility, the administration might as well have not even bothered to use it.